If you can think it, the Fender Custom Shop can probably build it. 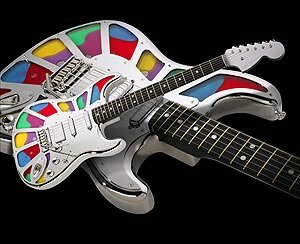 Based on Jimmy Stout's winning entry to Guitar World's 2004 'Design Your Dream Guitar' contest, the Splatocaster was realised by Fender Custom Shop veteran builder Scott Buehl who took up the task of creating the aluminum-framed, fluid-filled instrument. Buehl chose to go with bullet-proof, clear Lexan polycarbonate, formed into a hollow Stratocaster body to fit into the aluminum body frame. The hollow Lexan body was then filled with a fluid made up primarily of paraffin oil, distilled water and food coloring to form a swirl-a-licious ever changing pattern of colors! I don't know about the way this guitar sounds, but at least it looks pretty cool...! I'd like to try it in my own hands, I just like exclusive instruments!